The Manor's transport network reflects the growth of urbanisation from the Industrial Revolution to the late C20th with road, canal and rail marking out the area as one of the Black Country's focal points. 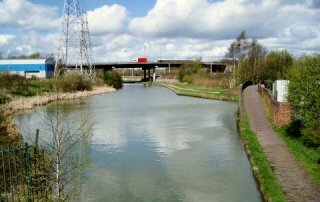 Teaser watchers George Cox and Paul Wakelam correctly pin pointed this view of Telford’s 1837 Birmingham to Wolverhampton canal from Anchor Bridge, Anchor Lane with the late 1990s Black Country Route making the newest crossing. On the right the canal divides to follow the 1772 route of Brindley’s canal to Birmingham - now known as the Bradley Arm this terminates abruptly after only two miles. Follow this link to find a little more about our Easter teaser. Ian Austin, Dudley North's new MP, sang the praises of the area in his maiden speech even offering to buy a pint of Holden's best brew to visiting MPs. He suggested his colleagues might like to visit the Society's website to brush up their Black Country knowledge. Read the Hansard quote here. The recent history of the Manor can be followed in the pages of many local newspapers. They are not the first place for accuracy, but often the only place for written evidence of an event, happening or details of the famous and not so famous. The area has been covered by acres of newsprint from the Wolverhampton Times and Bilston, Willenhall, Wednesfield and Sedgley Journal, surely the longest title ever used, to today’s Express & Star, Britain’s biggest regional evening paper. The former lasted for one year from November 1874 and the latter started in 1889. Other notable resources for historians include the Wolverhampton & Staffordshire Advertiser [1789 ~ 1930], Dudley Herald [1866 ~ 1973], Midland Counties Express [1867 ~ 1930], Dudley Chronicle [C20th to date], Wolverhampton Chronicle [early C19th to date], and Black Country Bugle [1973 to date]. Searching Birmingham based newspapers can also provide an insight into village life over the last 300 years. A directory of over 1,000 titles published in the West Midlands since around 1700 is now online at www.newsplan.co.uk Here you can enter place names to find titles, their lifespan and where the original copies are archived.